Beef Caldereta is braised beef in tomato sauce, potatoes, sweet peas and bell pepper which distinguishes this dish from beef mechado which is a similar dish but with only beef, potatoes and carrots as the main ingredients. 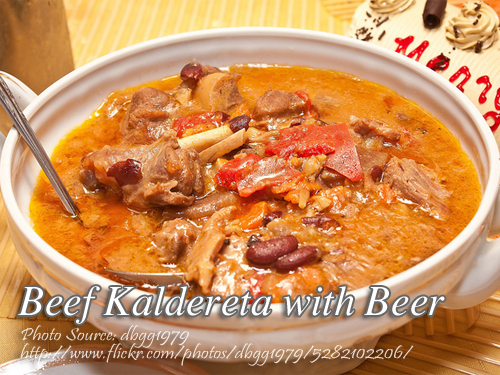 And this is not the usual caldereta that you used to love because this version of kaldereta recipe has beer in it. This will definitely add more distinctive taste and flavor of the dish. To cook caldereta with beer; Sauté garlic and onion in oil, stir in beef and toss for 3 minutes until slightly brown. Add tomatoes and tomato sauce, simmer for 1 minute, add beer and simmer until meat is almost tender. Then add potatoes, peppers, sweet peas, liverwurst, tabasco. Salt and MSG. Continue simmering until potatoes are cooked and beef is very tender. Sauté garlic and onion in oil, stir in beef and toss for 3 minutes until slightly brown. Add tomatoes and tomato sauce, simmer for 1 minute, add beer and simmer until meat is almost tender. Then add potatoes, peppers, sweet peas, liverwurst, tabasco. Salt and MSG. Continue simmering until potatoes are cooked and beef is very tender. What’s the taste of Caldereta with beer? Almost the same, it just has more distinctive taste and flavor. Hi Joan, I think San Miguel Pale Pilsen or any Pale Lager beer will do. Since it is a Filipino dish, a Filipino beer is appropriate like San Miguel beer.